Did you know that August 30th is the 3rd Annual Cabernet Day? Yep, Thursday is the day we celebrate all Cabernet grape varieties (Cabernet Franc, Cabernet Sauvignon, Cabernet Pfeffer, and Cabernet Blends). I looked back at my blogs over the years, and Cabernet is probably the most mentioned grape variety. This is not intentional, but just shows how this grape is so ingrained in our everyday wine conversation. Even when I look at the statistics on my blog site, I can see that “Cabernet Sauvignon” is the most searched phrase by a 4 to 1 margin, over the next most search phrase, “wine bottles”. The article about Cabernet Sauvignon is also the second most read article over the years. So, it looks like you all really like Cabernet. Well who doesn’t? That’s a rhetorical question, as I know a lot of people who just feel there is too much tannin, or the wine is just too heavy. My suggestion…try some different styles of Cabernet. Yes, they do taste different if they are produced in France versus California, or Chile versus Australia. Not to mention Italy, Spain, Argentina and Washington. Where did this annual celebration start? It appears to be something that was started on one of the social media sights, just hard to tell which one. You can check out Eventbrite or Facebook for more information on how to hook up on the social media networks, and share your cabernet experience. If you do a search for “Annual Cabernet Day” you’ll find events all over the country (and the world). In celebration of this day I have decided to put a link to all the articles I have written that mention Cabernet Sauvignon. I hope you will go back and look at some of the articles I posted over the years, but most importantly, I hope you will join in the celebration, and share your cabernet experience. 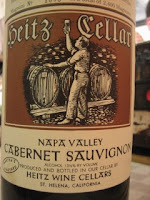 It is Labor Day weekend of course, and what would go better than a nice Cabernet with your end of summer BBQ?. What is your favorite Cabernet? Do you prefer it blended with other grapes? 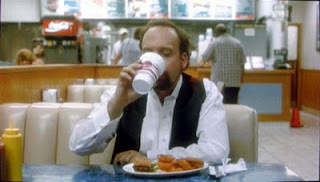 Ever since the movie Sideways came out in 2004, just the mention of Merlot has given me flashbacks to the scene where Miles is adamant about not drinking the wine ("If anyone orders Merlot, I'm leaving. I am NOT drinking any f***ing Merlot") , instead preferring his much vaulted Pinot Noir. Now I must admit, I am a Pinot Noir fan, but I also love a good Merlot. What do you know about Merlot, and do you still drink it? 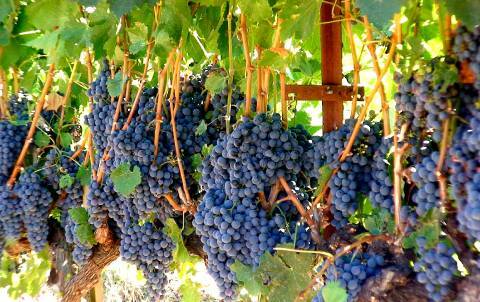 Merlot is one of the original Bordeaux grapes. The first recorded mention of the grape occurred in 1784. It is thought that the name Merlot comes from a similar French word for Blackbird: "Merle". The lineage of the grape is not certain, but it is most definitely related to Carménère, which for years, was confused with Merlot in the vineyards of Chile. 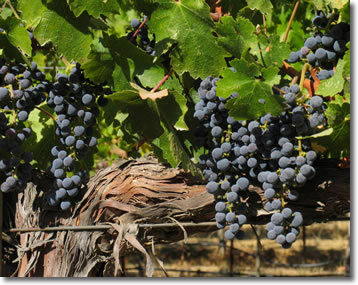 Merlot is considered one of the Noble Grape varieties, and is used both as a blending grape, and a single varietal wine. When used for blending (typically with Cabernet Sauvignon, Cabernet Franc, and Malbec) it adds body (via higher alcohol), color, richness and certain amount of softness to the blend. Naturally low in acidity, Merlot can help balance out a higher acid grape variety. In the Bordueax region of France, Merlot is typically part of the blend, and is used as an "insurance policy" for the Chateau. If the Cabernet Sauvignon crop is marginal, they may be able to save their vintage with the addition of the Merlot grape, which is the most planted grape in Bordeaux. On the right bank, which has cooler, clay soils (versus the left banks' gravel) and a slightly warmer climate, Merlot thrives, and produces a wine with more structure than those on the left bank. One of the most expensive wines in the world is Château Pétrus, and it is mostly Merlot...so much for the lowly grape from Sideways! In the new world, Merlot has made inroads in Chile, Argentina, and New Zealand, but it is California and Washington where the grape has come into its' own. Originally grown in California, for single variety wines, it returned to its' roots as a blending grape, and found a home as part of the Meritage blend (the new world version of a Bordeaux). But, it is Washington that seems to be making waves with their style of Merlot (not to mention their great price points). The wines coming out of Washington are deep in color and well balanced. Columbia Crest and Chateau St. Michelle have been leading the pack. When those of us in the United States think of Washington state, we think it is just too far north to grow good grapes, but if you look at a map of the world, it is the same latitude as Bordeaux, France. The flavor profile for Merlot will vary based on the vinification process, and the growing conditions (soil, climate, etc). But in general, Merlot is a soft wine, with mild tannins, and dark in color. 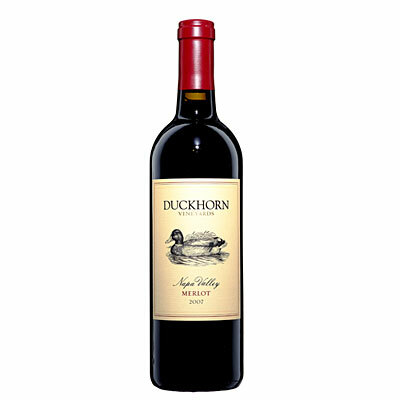 The most common flavors and aromas associated with Merlot are black cherry, plum and chocolate. But, notes of raspberry, figs, cinnamon, cloves and nutmeg (often described as Christmas Pudding or Fruitcake) are also common. Under ripe Merlot can display vegetal (bell pepper) similar to Cabernet Sauvignon. Most Merlots are made to be drunk young, due to it's low acidity and low tannins, but blended with Cabernet Sauvignon, the wine can last for decades (particularly those from the Right Bank of Bordeaux). The best new world winemakers are producing Merlot with more "backbone" that should last longer than your standard fair. Since Merlot makes soft, rounded wines, it is a good choice for many types of foods. It can handle herbs and spice (but not too spicy as the heat will accentuate the alcohol), as well as fowl and red meat. 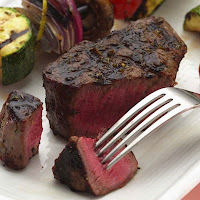 For a heavier version of Merlot, look for foods that would also work with Cabernet Sauvignon: steak, lamb, grilled meats. For lighter versions with more finesse, think like a Pinot Noir: salmon, pork, mushrooms. Stay away from light fish, and cream sauces, and also avoid blue cheeses (and strong cheese in general), which will overpower the wine. The ultimate expression of the Merlot in your glass, is determined by the approach of the winemaker. If he/she treats it like a Pinot Noir, then your wine will be light, smooth and full of finesse. 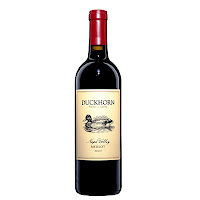 If treated like a Cabernet Sauvignon, then the the oak, and tannins will produce a heavier, more powerful wine. So, revisit Merlot, try different styles, and compare. If you have the money, try a St. Emilion or Pomerol, and compare them to the Washington and California styles. You may just rediscover what all the fuss was about, before 2004. 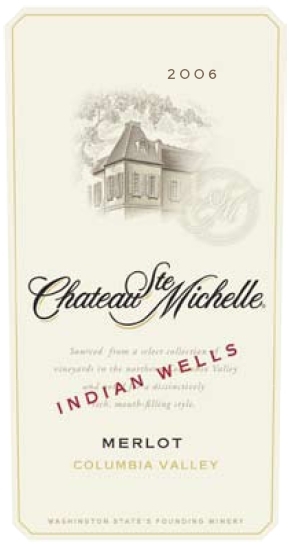 Oh, and the wine Miles drank at the end of Sideways, you know, the one he had been saving, and drank out of a styrofoam cup in the restaurant....it was a 1961 Château Cheval Blanc (a blend of 52% Cabernet Franc and 47% Merlot and 1% Cabernet Sauvignon, from the right bank of Bordeaux). Yes, the wine guy does drink beer too! Those of you who follow this blog regularly know that I mostly write about wine, but the job of a Sommelier does include beer, sake, spirits and in some cases coffee and tea (which I'll leave to others to write about). Last year, I attended the 2nd Annual Lake Arrowhead Brewfest, and really enjoyed tasting all the different beers. This year, the Brewfest celebrated its' 3rd year, and a different venue. 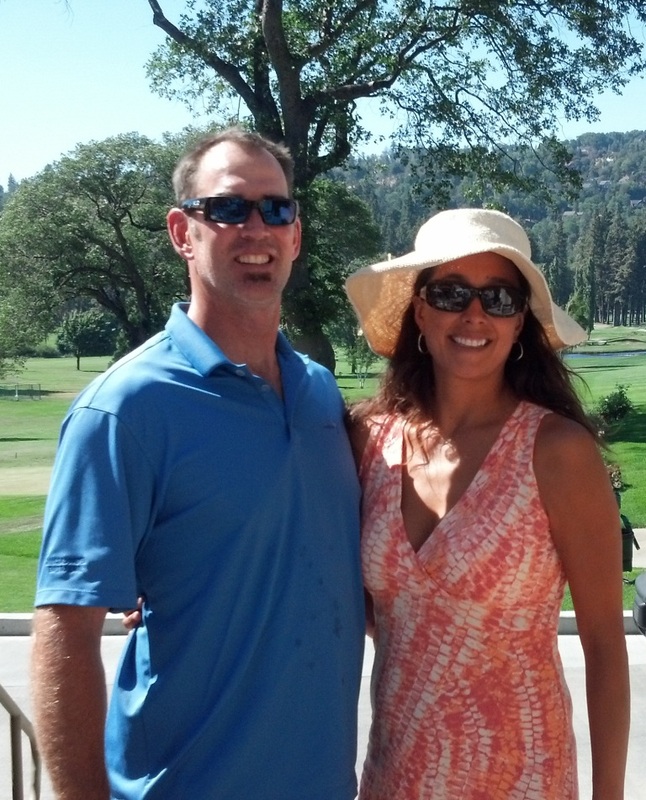 The 3rd Annual Lake Arrowhead Brewfest took place in the center of Blue Jay. The tents were set up early in the day (I know, since my office is across the parking lot). Gates opened at noon, and stayed open until 6:00pm. The entrance fee remained the same as last year, at $30/person, which included a souvenir glass, a program and discount coupons for the local businesses. Steve Nieto was at the music venue, and supplied background music and the occasional announcements. Every so often, the crowd would groan and boo, when someone in the crowd dropped their beer, and the sound of shattered glass broke through the conversation. The turnout for this years' event was larger than last year (over 500 in attendance) and there were more professional brewers and the addition of the High Desert Homebrewers Anonymous Club. A total of seven craft breweries were in attendance, including: Big Bear Mountain Brewery, Hangar 24 Brewery, Inland Empire Brewery, Stone Brewing, Green Flash Brewing, Dale Brothers Brewery and Firestone Walker Brewing. Each of these craft brewers brought anywhere from two to four beers to sample, and the High Desert Homebrewers had eight home brews, including Vanilla Bean Porter, Jackson Brown Ale, and Butterscotch Caramel Stout. The local Mountain Brew Club had a total of 23 beers on tap. With out six pour spouts in their booth, they had to rotate the kegs around every hour so guests could have an opportunity to try all 23. I was able to sample eleven on the home brews on tap. I tend to like smoother less "hoppy" beers, and found many of the samples (particularly the craft brewers beers) to be heavy on hops, and very bitter. It appears from conversations with those tasting, bitter is in. For me, my favorites were: Drunk Monk Belgian Blonde, German Girl Oktoberfest, American Amber Ale, Mountain Pilsner, and Cherry Stout. There were a lot of IPA (Indian Pale Ale) style beers, that were so bitter and hoppy, I actually poured a couple out (just not my style). Stone Brewery had one called "Saison de Buff". I heard great comments about this beer. It was bitter, and infused with parsley, sage, rosemary and thyme...sorry, just not what I look for in my beer. As as a wine guy, I savour the aromas and aftertaste. Bitterness is typically not something I enjoy in wine either. There was also a VIP tasting tent. Anyone who brought in canned food (or made a donation) for Operation Provider (the local foodbank) had their wrist bands punched, allowing them to taste one of four specialty beverages: Hard Cider, Blackberry Mead, Happy Sailor Ale, or a Bourbon Stout. While sampling the numerous beers available, I ran into Jason Torres, from www.BierBuzz.com. If you are looking for write ups, and reviews of beers, I'd suggest you check out his site. Really nice guy, and he had an entire crew with him (you couldn't miss them in their matching Bier Buzz shirts). At the end of the day, I was able to sample 25 of the approximately 52 beers available for tasting. Luckily I cut the pours short, as each vendor wanted to fill my glass at least half way. Some were poured out, and others sipped slowly, savoring each taste. It was a mix of good and bitter/sour for me. At 6:00pm, announcments were made for the winners of the homebrewers. 3rd Place went to HoneyDo Agave Wheat, by Jim Beyers; 2nd place went to Drunk Monk Belgian Blonde, by Steve Keefe, and the homebrew winner was Butterscotch Caramel Stout by Robert Regalado (in what I understand was only his third batch of beer ever made). The publics choice for craft brewer of the day was Green Flash Brewing. 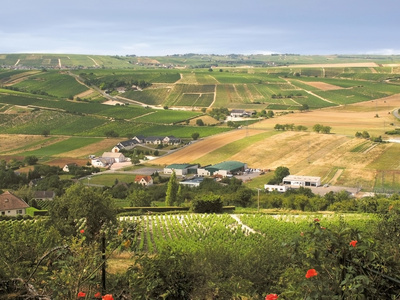 Whenever I talk about French wines, or do tastings, the first thought that people have is Bordeaux, Burgundy, Champagne, or maybe even some of the Rhone wines like Cotes du Rhone or Chateauneuf du Pape, but there are so many other wines and regions within France that get overlooked. Those of you that follow this blog, have read my comments about Reislings from the Alsace region, and some of the Roses that are coming out of Provence. 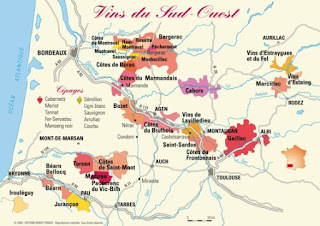 But some very good wines (at great prices) are coming from the lesser known regions of the Sud-Ouest (or Southwest France), which includes over 30 different AOC's. The Sud-Ouest is the area located between Bordeaux and the Pyrennes Mountaines. Some of my favorite wines come from Jurançon, Cahors, Madiran, Irouléguy. Additionally the Loire, and Alsace don't seem to get the same attention that the better know regions of France get. 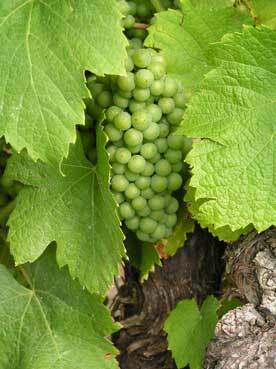 Some of the finest examples of Sauvignon Blanc, Chenin Blanc and Cabernet Franc come from the Loire. Outside of Champagne, traditional sparkling wines are called Crémant. They may or may not be made with traditional grapes, and can be very interesting variations from traditional Champagne. There are some other areas within France that do not carry the Crémant name. These areas typically make both a still and sparkling version of wine, so just go by the AOC name. This week I conducted a wine tasting of "other French wines". The idea was to move away from the mainstream grapes and regions, and try something different....and to keep the bottle price under $20 (usually difficult for French wines). I served six wines, from some of the regions mentioned above. The first wine was a sparkling wine: Vincent Raimbault NV Brut Vouvray. This wine comes from the Loire (Touraine district) and is made from 100% Chenin Blanc. Made in the traditional method, this straw colored wine, was bright, clean and has refreshing acidity. Aromas of lemon, grapefruit and flowers. The second wine was a white wine from the Loire (the western most district of Nantais), made with the Muscadet grape (also known as Melon de Bourgogne): Pepiere 2010 Muscadet Sevre et Maine. I really liked this wine. Nice acidity, dry, a slight yeastiness due to sur lie aging. The classic wine match for Muscadet is seafood (in particular shellfish), and it worked well with the numerous shrimp dishes at the tasting, but I'd sure like to try it with some oysters! Next was a Rosé from the Rhone region of Tavel: Mordoree 2011 Cotes du Rhone Rose La Dame Rousse. This full bodied, dry Rose was 40% Grenache, 20% Syrah, 15% Cinsault (and the rest Carignan and Mourvedre). Lots of strawberry and cherry, and savory, spice character, with a certain amount of earthiness.The finish was a bit bitter, and turned off some of the tasters, but others loved it. The first red wine of the tasting was the Chateau du Cedre 2007 Cahors. Cahors is located in South West France just north of Toulouse. This is an ancient Roman wine producing region with evidence of vines being planted as early as 50 BC. The Cahors AOC produces red wines made with the Malbec grape (known locally as Cot or Auxerrois). Yes, Malbec was growing in France before it made a name for itself in Argentina. I would put this wine somewhere between a Cabernet Sauvignon and a Merlot. Nice plum, cherry, and cocoa aromas, and moderate tannins. The second red wine was the Labranche Laffont 2005 Madiran. Madiran is a small appellation, only 3,200 acres of vineyard in total, but it makes big red wines from the Tannat grape. This was a deeply colored wine with dark berry flavors and moderate tannin. The seven years of age help mellow this wine, and presented a very smooth drinking wine. Lots of positive comments about this wine, and was one of the nights' favorites. The last red wine was very young, and required pouring through an aerator. The wine was Bernard Baudry 2010 Chinon Les Grezeaux. Chinon is the commune, in the Touraine district of the Loire, for Cabernet Franc, and an excellent value at only $22. The wine was bottled un-fined and un-filtered after spending 12 months in neutral oak (but did have a definite oak presence on the nose). It was full-bodied and probably should be held another 5 years before opening. So, the next time you are talking French wine, remember that not all good wines cost $60 to $3,000. Sure they are great wines, but you can also find some very good (and different) wines from some of the lesser known regions of France. Continue to explore and try...there are great finds out there! I never know where the next wine blog subject is going to come from. Sometimes, an event during the week sparks and idea, and other times it is questions from followers of this blog. I am always searching for ideas and subjects. 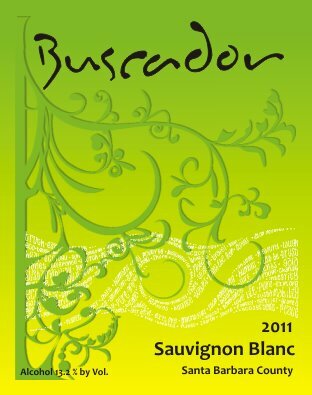 This week, the "searcher" came to me, in the form of Buscador Wine. What? You haven't heard of them? Well, that's no surprise, as they only make about 400 cases total. 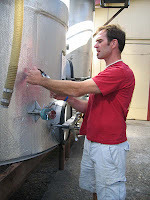 But, if you are like me, you are always looking for one of those "up and coming" winemakers. The ones you can say, "I knew them way back when....". 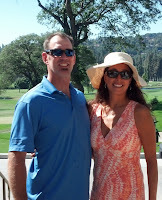 I was at the Lake Arrowhead Country Club at the outdoor pub, and they happened to be having a wine tasting. Behind the table were Matt Kowalczyk and his wife Stephanie. They had driven up that day from Santa Ynez, and were heading back that night. After talking a bit, I learned that they were the owners and winemaker for Buscador Wines (Spanish for a person dedicated to seeking out new experiences...a searcher). Matt and Stephanie are outgoing and friendly. As I talked with them, I learned that we had numerous winemaker friends and contacts in common. Their path to winemaking was interesting. After spending time in Switzerland, France, Spain and New Zealand, Matt ended up in the Central Coast, and has been making wine for the past seven years along side winemaker Mike Brown at Kalyra Winery (remember the movie Sideways?). Stephanie is a Biologist, who spent time working in New Zealand, at Cloudy Bay (home of the world renowned Sauvignon Blanc). At the Buscador tasting table, they were offering five wines. The first wine was the 2011 Sauvignon Blanc. On my first sip it reassured my belief that the best Sauvignon Blancs in California, are coming from the Santa Ynez region. Good, crisp acidity with citrus and herbal aromas. The second wine was the 2009 Chardonnay. All barrel fermented with a slight bit of oak on the nose, and that yeasty character you get from sur lie aging. Next we moved on to the red wines. First up was the Buscador 2010 Pinot Noir. 100% of the grapes came from the Rancho Camp Alamos vineyards in Los Alamos. This didn't taste like your typical California Pinot Noir. It was much more Burgundian in flavor and aroma. Only one barrel (or about 20 cases) were made of this wine. I picked up a few bottles to store away for a few years (along with an allocation of Sauvignon Blanc). While it is very pleasant now, I think three to five years of aging will make for a beautiful wine. The second red was the 2008 Petite Sirah. This is one of those rare 100% Petite Sirahs. All the grapes were sourced from the Solana Farms Vineyard on the warmer east side of Paso Robles. Matt was really proud of this wine, and it was obvious that this is the style of wine he drinks himself. The last wine at the tasting was the 2009 WaveSlider, the only blend in the mix. The grapes were organically grown, and a mix of 65% Syrah and 35% Petite Sirah. Very Southern Rhone in style. What I found amazing was the price points. 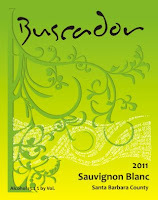 Buscador wines range from only $14.50 to $32.00 (and up to 30% off that if you are one of their wine club members). Speaking of the wine club, in talking with Matt, he tells me that membership in their wine club is free. Right now the wine club is so small, you will even get a call from Matt himself asking you which wines you would like to purchase, and he'll create the shipment mix you want. The wine club may be the only way to get some of his wines too. His last vintage of Malbec is already gone, and he is talking about trying some Roses, which I'm sure will disappear just as quickly. 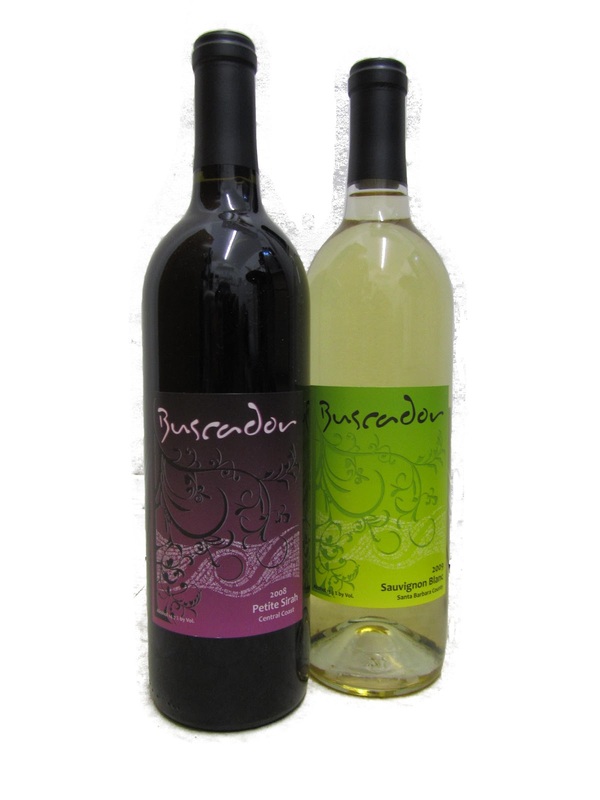 With such small production, and growing acknowledgement of their quality wines, now is the time to get in on the "ground floor" with Buscador Wines. or, you can also follow them on Facebook .